Yes, I did say ditch, and I mean exactly that. I live my life somewhat like Ricky Bobby from Talladega Nights, except in a itty-bitty female brunette version. Basically “I wanna go fast,” and “If you aint first you’re last” are my life motto’s. Judging by as many times as I’ve been pulled over for speeding, I’ve done a pretty good job living up to those motto’s. So let me take you back to 15 year old me, pre-driver’s license and the days when I was not allowed to drive anything besides a tractor… especially a 4-wheeler. One Saturday morning I ventured to the dam to mud with my boyfriend at the time and his buddies, I was under strict instructions that I was ONLY to ride on the back of the 4-wheeler and to not get too crazy. I did really well, to abide by these rules, that is until later in the afternoon when we all decided to change venues and mud along the Neosho River, and then eventually on to race down the dirt roads between Fairland and Wyandotte… somewhere in that, my mind misplaced the guidelines I was supposed to follow for the day, and suddenly I hitting the throttle and tearing down the dirt roads of my home county. Excited that I was in the lead I glanced back to see how far behind everyone else was. Next thing I know I was off the road heading into a deep rocky ditch. Thinking fast, I tried to prevent what I saw ahead of me, but instead over corrected, lost control of the 4-wheeler and landed at the bottom of the ditch with the 4-wheeler upside down and on top of me. Look mom no hands! At a whole whopping 2 mph. 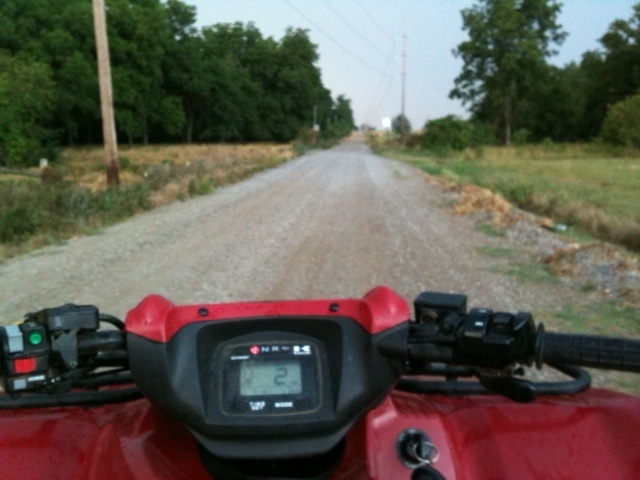 Fast forward to present day, older, sometimes wiser me, with access to my parents 4-wheeler whenever I want, chose to drive it to my fishing spot last night. When I have a lot of mind and don’t know how to sort through my emotions I drive and fish. I believe everyone talks to God in their own way, for me it’s always been while I am doing one of the two things I just mentioned. There’s something about an open dirt road or a bobber floating in the water that makes everything confusing in life disappear, even if it’s just for a hour or so. However as soon as I got there a thunderstorm started and I was forced to head home. On the way back the rain picked up and I had to pull over and sit beside the road and continue being drenched to the bone by the rain. 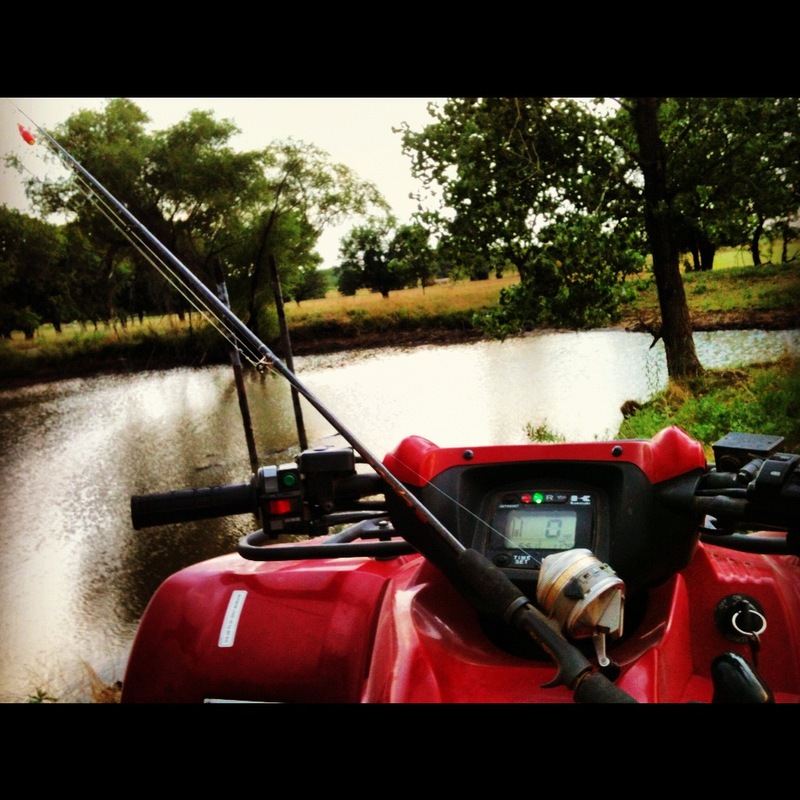 Left with only the sounds of the rain falling, the 4-wheeler engine, and my own thoughts, I thought back to the above story and realized life can be a ditch. Sometimes you’re flying down the dirt road, driving fast, laughing, and then next thing you know you’re laying on sharp rocks, in the bottom of a ditch being crushed by the weight of whatever has fallen on you. From here you have two choices: you can crawl out of the ditch, let everyone know you’re wounded and take on the repercussions of letting everyone in on how you’re feeling OR you can straighten your step, cover up the bruises, put a smile on your face even through the pain and chalk it up to a life learning experience. The choice is yours. God has a way of explaining things in a way this southern country girl understands best, however he could’ve left out the lightening out of last night’s dirt road conversation… he can be so dramatic sometimes. You are unbelievable. You are your Daddy’s Daughter!!! I remember a few of his boo boos!!! Oh Danielle! No wonder I wake up sometimes during the night praying for my family! Your daddy has done his fair share in his time! That’s why God gives up “second chances”! Love you and will continue to pray! Lol! I’m sorry Grandma, mom tells me frequently that my guardian angel is tattered and exhausted from keeping up with me. Love you too!